PROMPT® - "Prompts for Restructuring Oral-Muscular Phonetic Targets" is a tactile/kinesthetic/sensory based approach for re-organizing movement patterns resulting in better oral language production. The technique uses touch or tactile/kinesthetic/sensory input on the muscles of the jaw, lips, face and tongue (tongue or mylohyoid muscles are located under the chin). This input facilitates the development, or restructuring, of speech production. All input is done outside of the mouth. It may be viewed as physical therapy for the mouth because it is based on motor learning theory. Sounds are not taught in isolation, but in syllables or words used for meaningful interactive communication. In the sequence pictured above, the therapist is helping the child say ‘new’ to tell her he wants a “new” song. He leans into the therapist’s hand as he has learned that this input can help him say words and make himself understood. 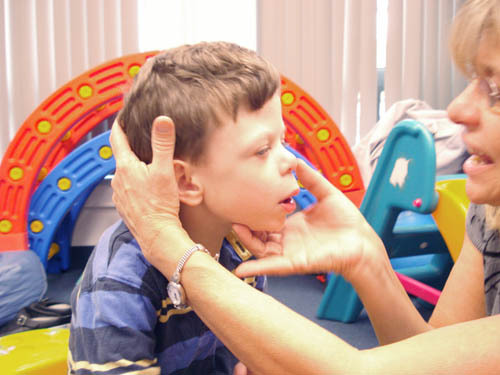 The PROMPT®-trained speech-language pathologist helps to manually guide the oral musculature to produce sequences of sounds in words and sentences. The Motor Speech Hierarchy and Motor Speech Analysis (Deborah Hayden, 1995) are used to evaluate the individual strengths and weaknesses of the child or adult’s motor speech system. The words and phrases selected for the individualized therapy plan are based on what the client can produce and use for successful interactive communication. The words and phrases reduce the motor load for the client, increasing the success and eliminating incorrect patterns. These ‘target’ words and phrases become the exercise, which is practiced in meaningful communication. Think of swinging a tennis racket. Behind you the tennis pro guides your movement. The rhythm, timing and trajectory of the movement are critical. The first few tries may not seem to do anything; however, your mind body connection evolves when the correct movement pattern is practiced. This correct sequential movement pattern which was originally ‘felt’ through the guidance of the tennis pro affects your motor memory, so that finally you will be able to hit the ball over the net on your own! PROMPT® is very similar in that it tactually and physically stimulates the correct muscle patterns for producing sound sequences. The therapist can increase or decrease range of motion and control for asymmetrical movement. Timing and transitions from one sound to the next can be shown to the client through touch resulting in refined and intelligible speech production. Traditional speech and language therapy relies on the person matching what he hears with what he sees the therapist doing. PROMPT helps the person achieve and auditory and motor match based upon the tactile input given by the therapist. There are four levels of prompt for all sounds in several languages. The therapists learn all prompts in the first hands-on workshop, but need continued support and training through a process which helps refine hand movement as well as understanding of motor learning principles. Proficiency of hand movement increases after correct practice which embodies the same motor principles needed for learning speech sequences.